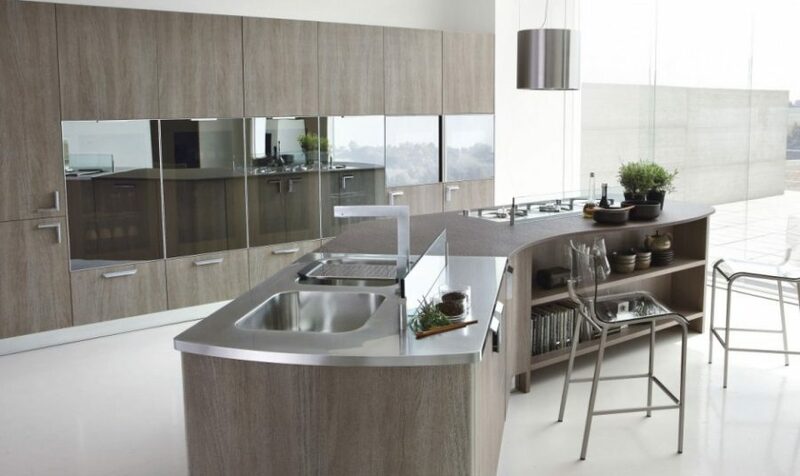 Kitchen cabinet designs are numerous and highly customizable these days. 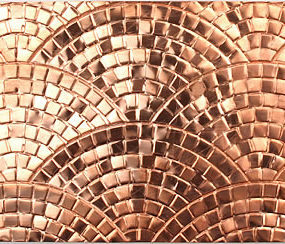 Easy to assemble and install they come in a dizzying assortment of colors and finishes. 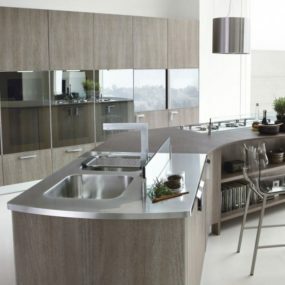 Contemporary kitchen cabinets are usually thought of as glossy and plastic, but there are many other different options. 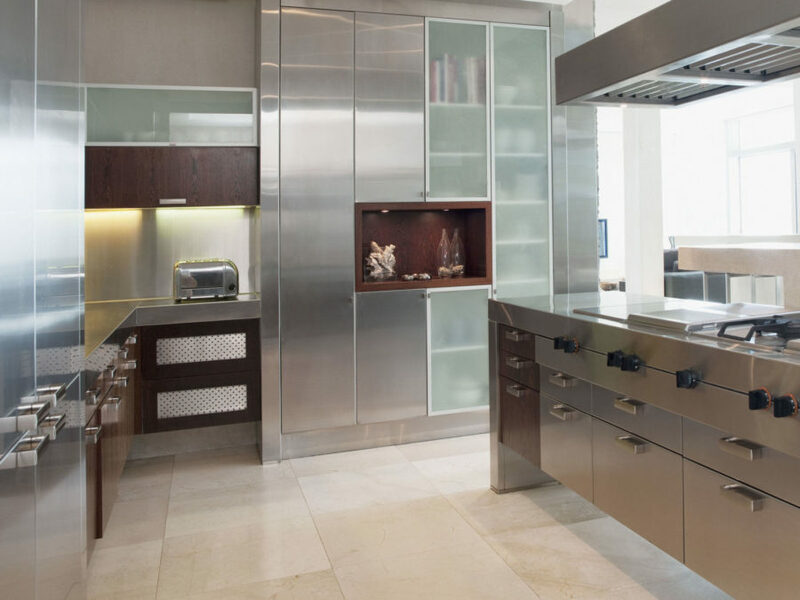 From minimalist wood to stainless steel to pure glass, modern cabinetry can excite and surprise with creativity. Wood persists as the most popular material of choice, though, and it’s not surprising. Wooden cabinets can be repainted, repaired, and repurposed time and again and there is an undeniable charm to them. 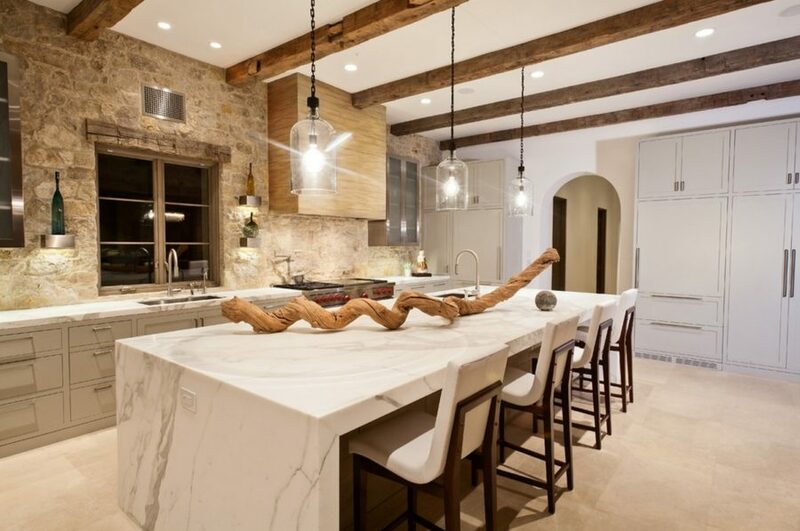 Minosa Design created this gorgeous French style kitchen. It looks traditional, but only from the first glance. 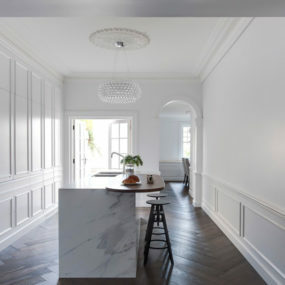 The white cabinets blend well with white walls disguising all technology and a cooking countertop behind molded doors. 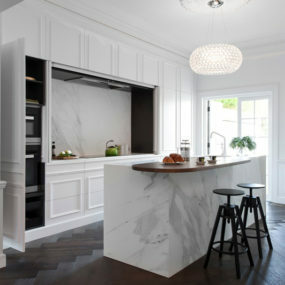 Only a marble kitchen island gives away the room’s purpose. 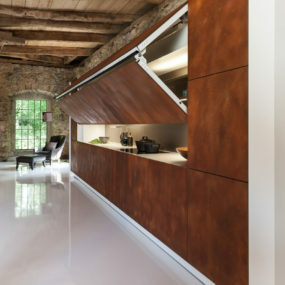 Its wooden countertop creates a separate cantilevering breakfast table. The retractable walls of the cabinets shows off a beautiful matching marble backsplash in the center. The rest of it is used for storage. Though heavily influenced by French style the cabinets are very much minimalist and definitely show a modern approach to design. Many styles get modern treatment by designers these days. Art Deco is no exception. 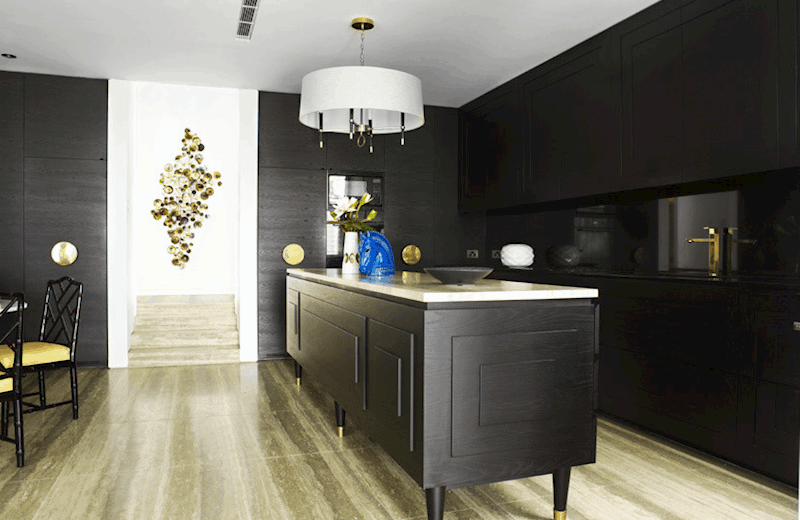 This amazing kitchen features minimalist Art Deco cabinets with a glossy backsplash and golden metallic accents. 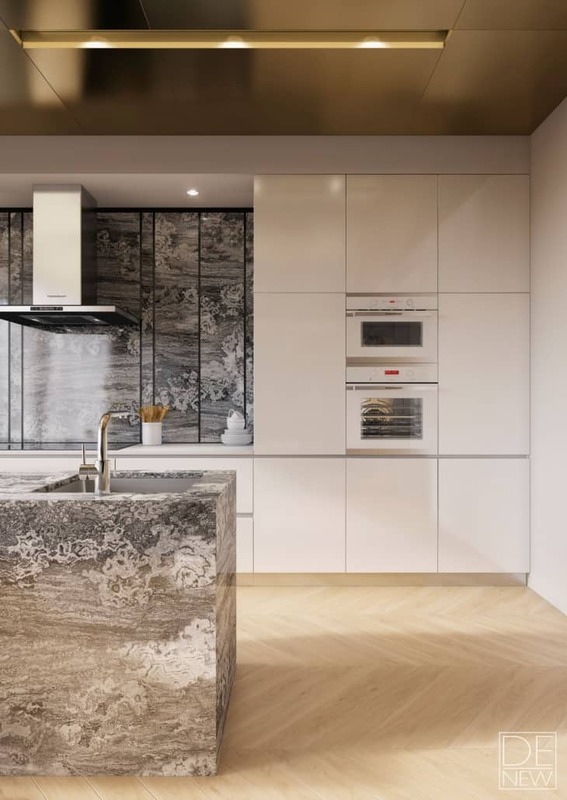 But the star of the interior is, of course, the kitchen island decorated with layered wooden panels and golden leg tips and a contrasting white countertop. 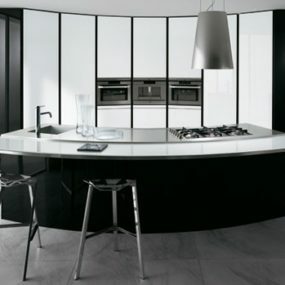 StudioFour‘s black and white kitchen stretches from the floor up to the ceiling. 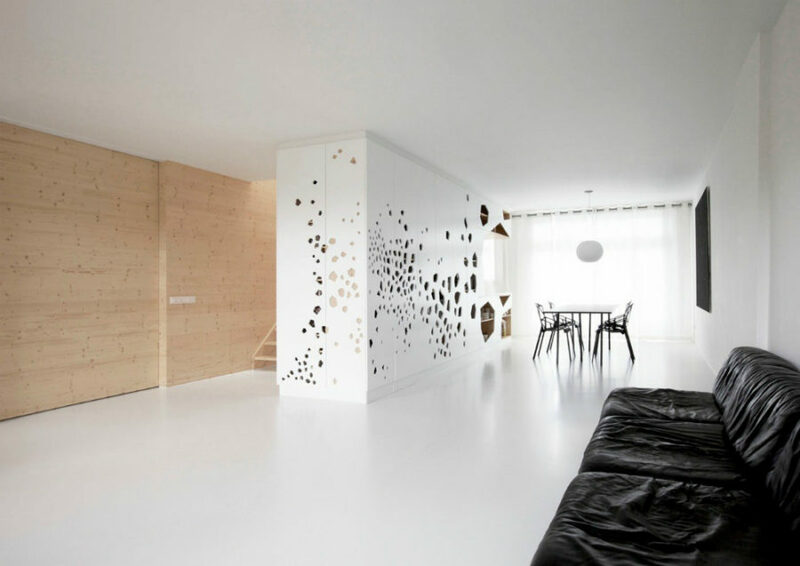 In fact it occupies an entire wall of this modern home. Its white kitchen island contrasts with the prominent main body where storage and stove are incorporated. This contrast brings a great dynamic to the interior while the natural wood dining table takes it further. 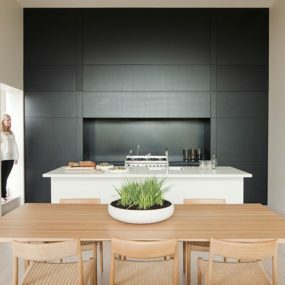 Even though they are made of wood the kitchen cabinets are so minimal they look very clean and modern. Bigger kitchens are definitely a new trend. 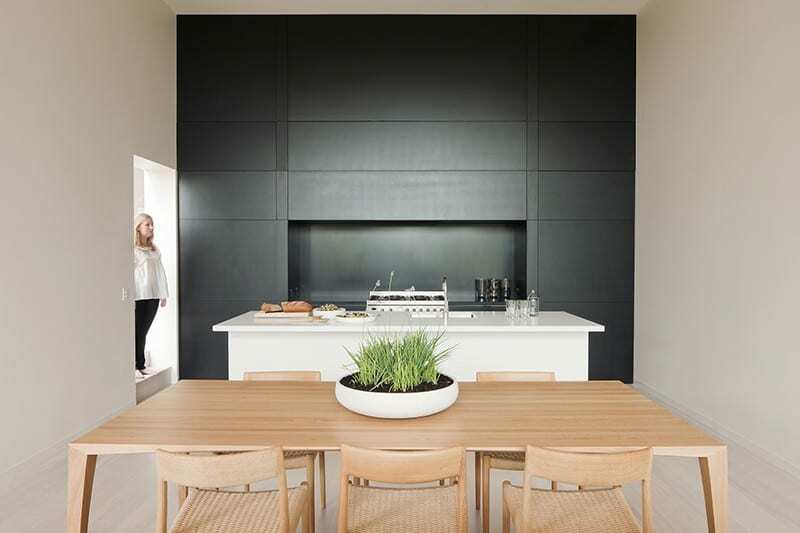 Balancing Home by Luigi Rosselli Architects features minimalist kitchen cabinets that occupy two entire walls and could probably fit half of a house. They disguise a refrigerator and only an oven and hot plate stand out. Keeping a kitchen like this clean and picture-perfect is quite easy. The cabinets make the bulk of the design; no additional details are needed, hence the clean look. 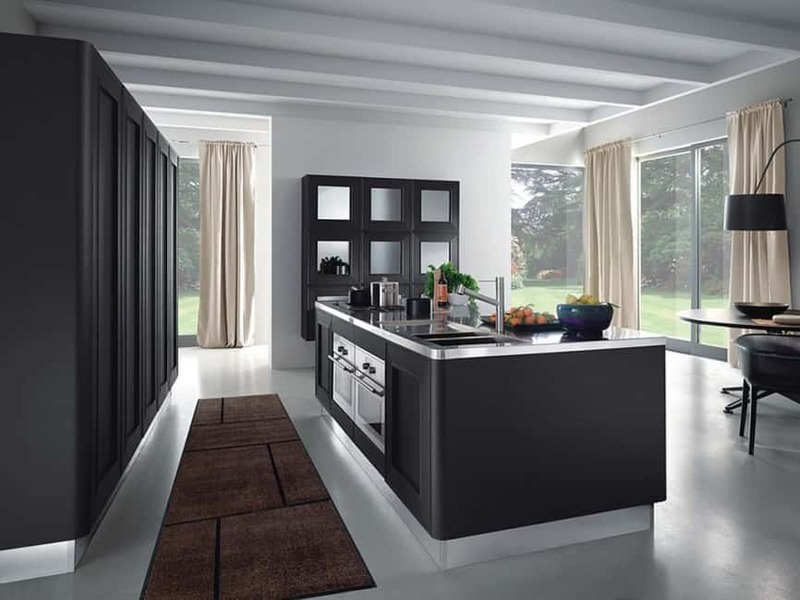 Freestanding cabinetry is another great contemporary kitchen trend. It can occupy as little (or even less) space than a built-in option. It also offers a different look for the kitchen. That is a very fresh look that also has a touch of luxury to it. 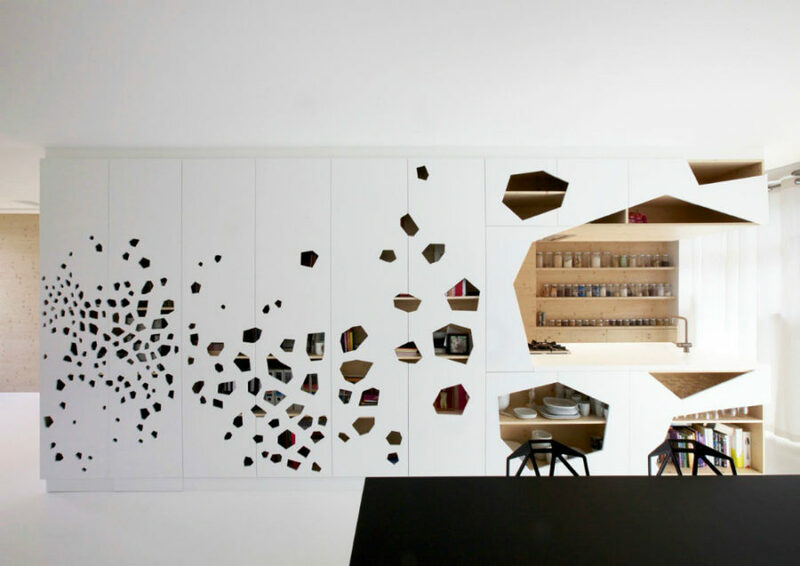 Of course, you’d have to manage space carefully as these cabinets usually have less storage capacity. 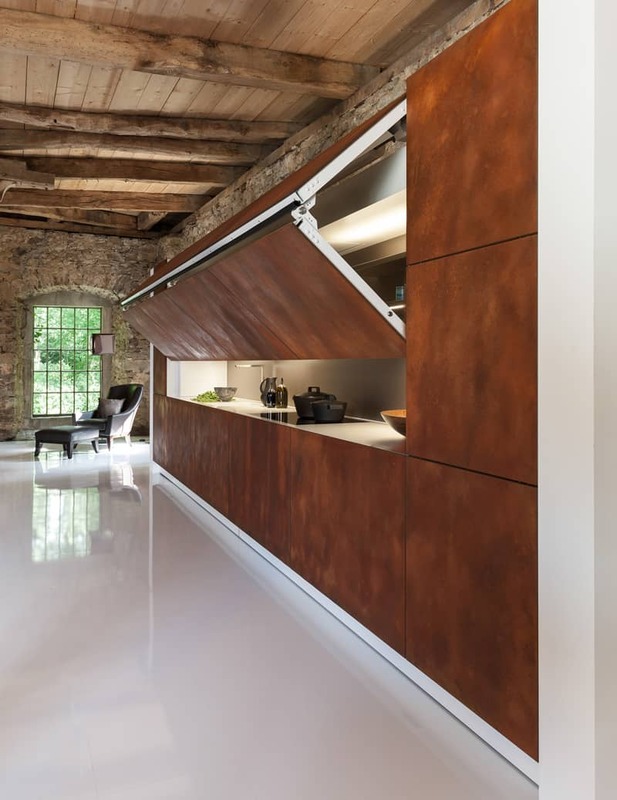 This home in Switzerland features a contemporary kitchen with a freestanding unit and a contrasting kitchen island. Made with elegance and in neutral color it works well with the interior that has wooden floors and ceiling contrasted by white walls. The kitchen island features an extension for a breakfast bar and seems like it’s highlighted by built-in lighting. 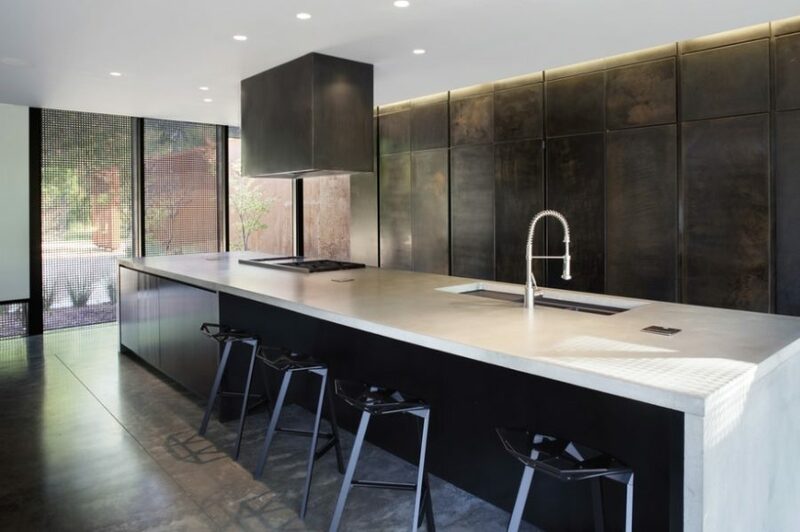 While some minimalist kitchen cabinets attempt to blend with the walls, others purposefully stand out. This incredibly sleek design is looks drawn on. 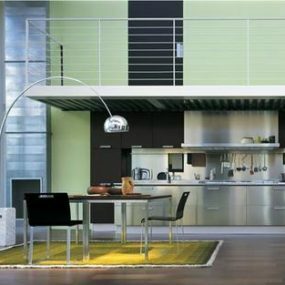 Also more walls are being used in a modern kitchen to create more storage space. Thus space above the sink and cooking area can now be free from hovering furnishings. 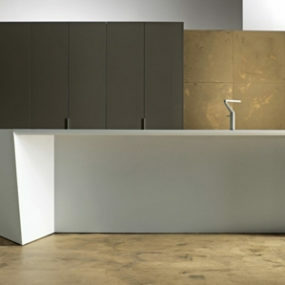 Such is the case with this ultra minimalist kitchen by De | New. The only thing that hovers above the stove here is the hood. A backsplash is decorated with the same material as the kitchen island bringing dynamic to the white room. The cabinets hide everything apart from the ovens giving the room a clean look. Modern design makes the best of built-in cabinetry, which literally transforms the modern kitchen. Minimalist kitchen cabinets can surely keep the kitchen looking neat, but some old ideas are coming back. For instance, niches weren’t the most popular of design elements, but now a lot of contemporary kitchen interiors and cabinets have them. 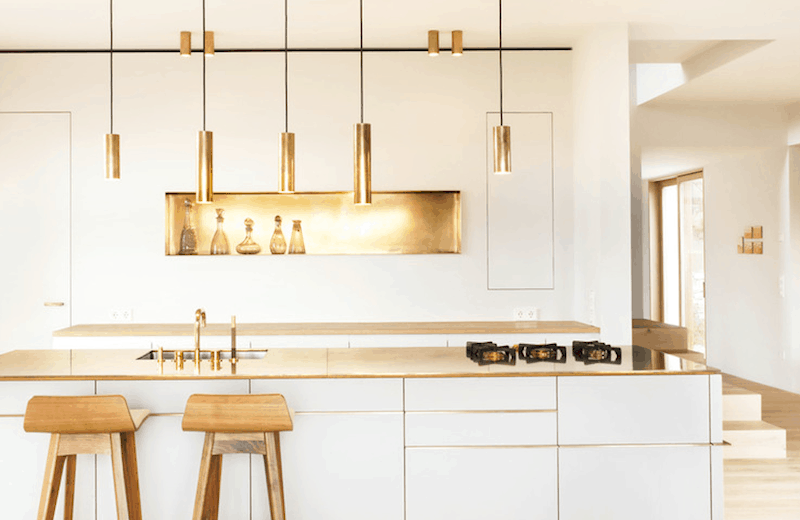 Here the golden niche echoes metallic lights that stand out beautifully against the white minimalist cabinetry. 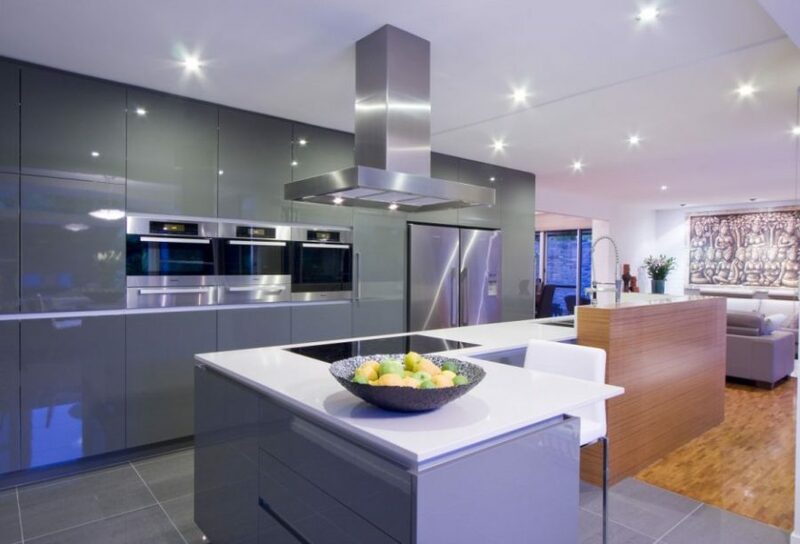 Designer Darren James has created these contemporary kitchen cabinets for an open layout interior a few years ago. His task was to integrate them into the living room. Here’s where the glossy finish helped to keep the kitchen visually separated. A very stylish shade of grey goes well with the stainless steel technology in the kitchen and natural wood accents in the living room. 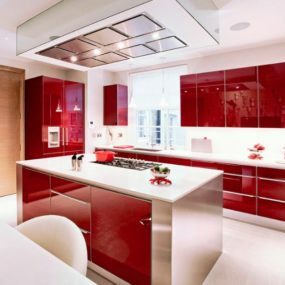 Red glossy kitchen cabinets can be hard to pull off, but when the shade and finish are right it looks great. 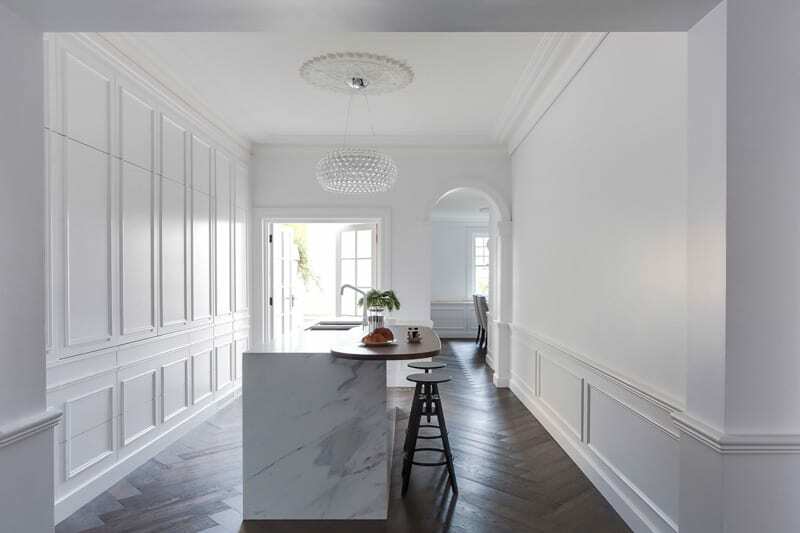 The glazed cherry hue in this kitchen contrasts well with the stark white surfaces. Stainless steel accents the kitchen island. Red is a very intense color so be sure you’re in love with it not to get tired quickly. And keep the rest of the kitchen neutral, it will help balance it out. 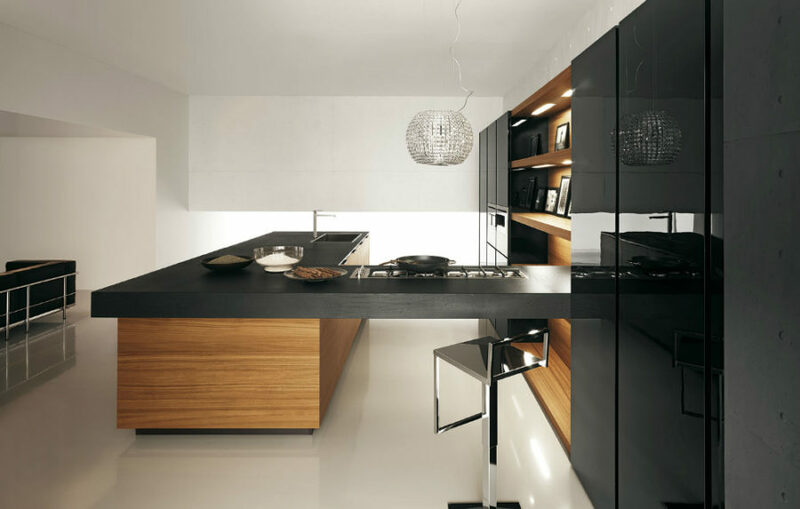 Black gloss in Yara by Cesar looks ultra modern and stylish. The natural wood accentuates it well. 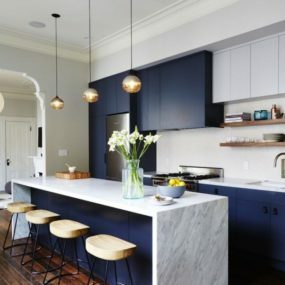 The design idea is quite unique as it connects the cabinets with the kitchen island with a cooking table. There is enough space for hidden storage as well as for displaying decorative things like framed photos, which is rare for a kitchen. Many modern designers go with the easy space-efficient rectangle shapes, but others also experiment a lot. This unique kitchen is clearly a result of that. 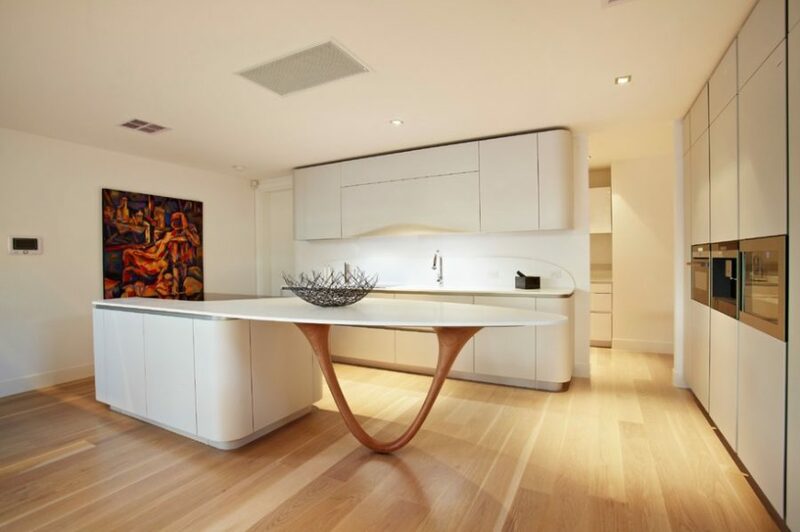 Its curvy corners give it a futuristic vibe. 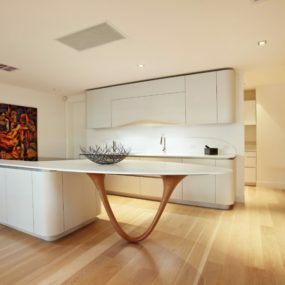 And the kitchen island comes with a sculptural base. There are quite a few futuristic kitchens out there, but only few go on the market. Of course, if your heart is set on the look you could always order a similar custom design. It’s all a matter of budget and space. 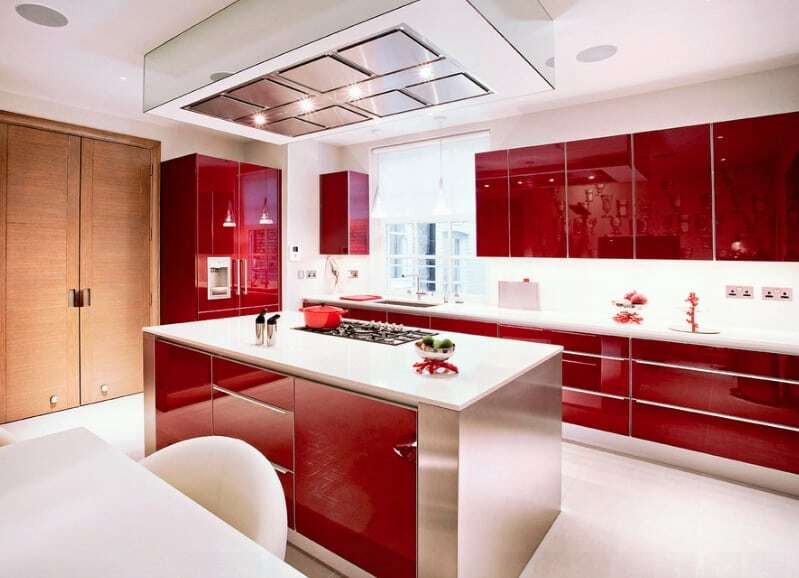 Glass and mirrors may not be the most practical kitchen materials, but they are used a lot in contemporary design. 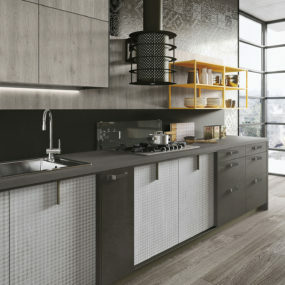 MILLY Kitchen from Stosa Cucine boasts surprising cabinet features. Glass fittings vary from transparent to smoked to floral. It’s hard to imagine the level of maintenance these would require. On the other hand, reflective glass surfaces do make space feel bigger and airier. Japanese designer Tokujin Yoshioka went further than the most. 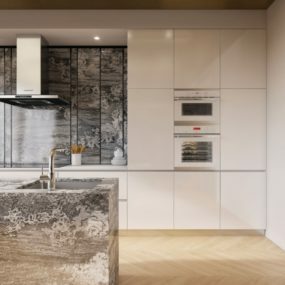 He created a modular kitchen entirely out of smoked glass redefining the look of a contemporary kitchen. Complete with a stainless steel countertop the kitchen shows off all the beautiful tableware and utensils you own. 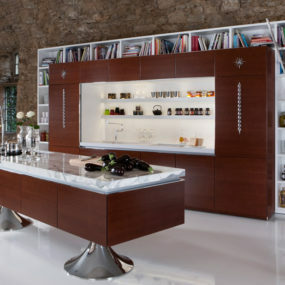 Library kitchen designed by Philippe Starck for Warendorf makes a case for multi-functional kitchen cabinets. Consisting of two sections that combine cabinetry and an open shelving unit the kitchen offers a lot of storage space for both dishware and books. Thanks to the built-in ladder even the top shelves are easy to reach. But that’s not all. There is a separate kitchen island for washing and preparing food with a thick marble countertop and a state-of-the-art tap. 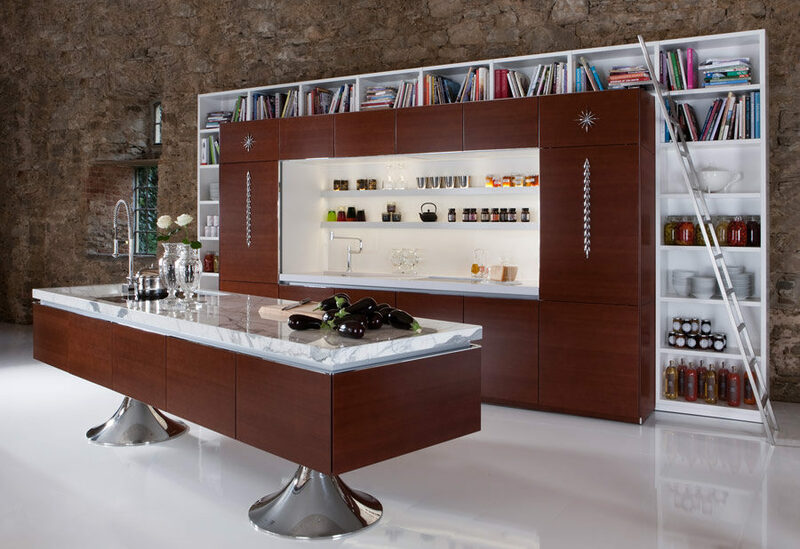 Warendorf aren’t bad at all themselves in creating contemporary kitchen cabinets. For instance, this hidden kitchen unit does not only feature an intriguing metallic finish but also has a shutter mechanism to disguise the sink and stove. When open it offers a working surface, built-in lighting, and floating shelves for bowls and spices. 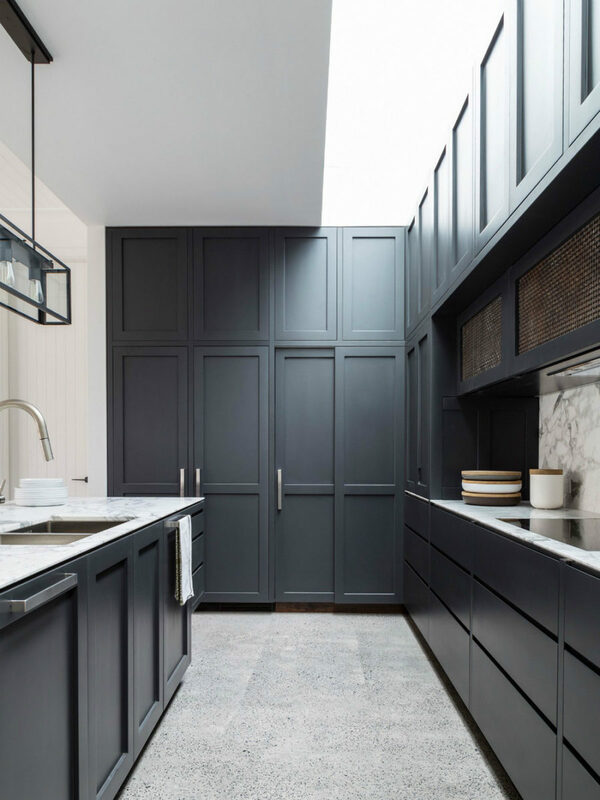 Gunmetal steel kitchen cabinets is something you don’t see often. 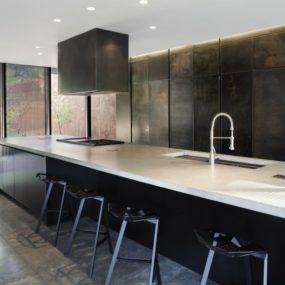 The brutal aesthetic looks completely unique especially in kitchen design. It definitely has that industrial vibe to it only with a heavy dose of minimalism. 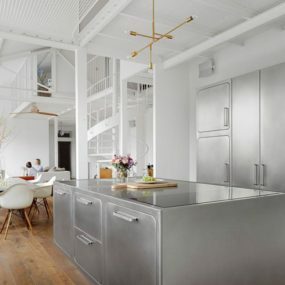 If you are after a more polished industrial look stainless steel may be your best option. It works not only for countertops. The steel cabinets may give the kitchen a sterile look, but it’s nothing that a few wooden accents can’t fix. 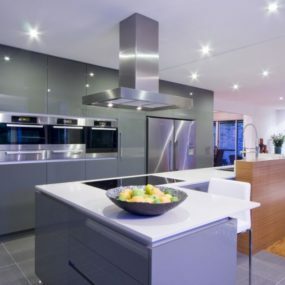 Beside their aesthetic, of course, they are practical in a way that you won’t have to worry about them not matching your stainless steel technology. 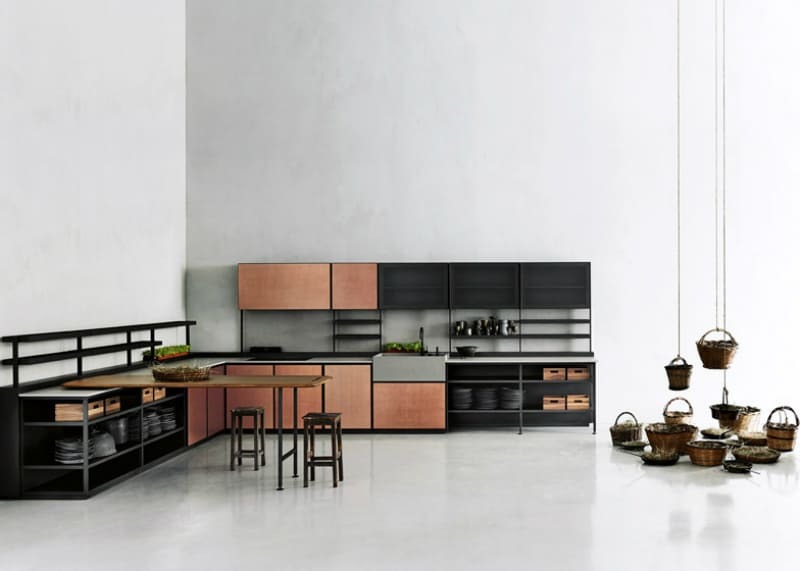 Salinas kitchen cabinets Patricia Urquiola designed for Boffi are simple and modular. They also feature so-called “trenches”, which allow to hide all the electrical wires and keep the kitchen looking neat and clean. The square and rectangular metal cabinets come in matt black, copper, zinc, and other finishes. Mixing and matching these could really create an unusual look. Metallic kitchen cabinets aren’t to be used for the entire kitchen though. 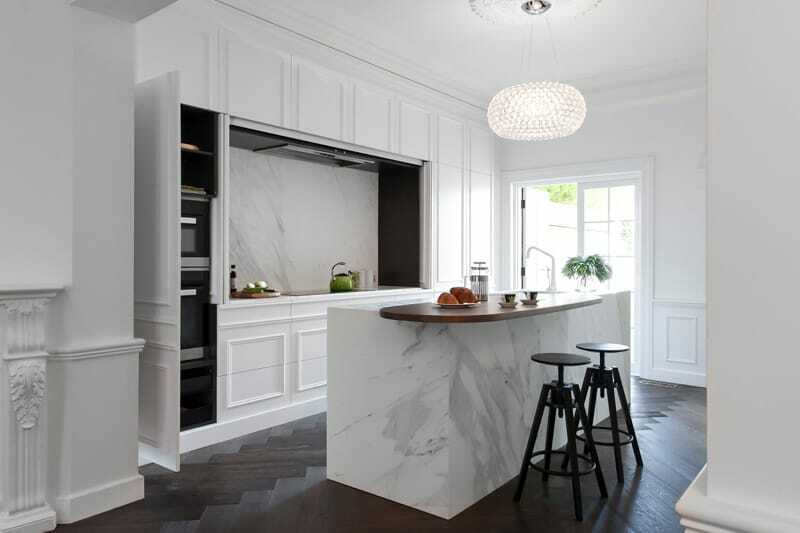 They can go well with minimalist wooden cabinets as well as accentuate the beauty of marble. Stainless steel isn’t the only option either. 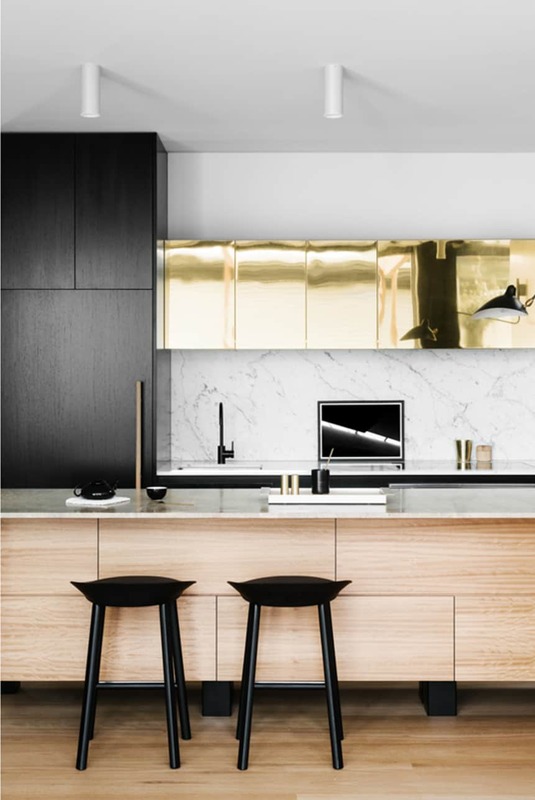 A more trendy golden brass can bring so much glamour to your modern kitchen, it’d be hard to keep your eyes off of it. 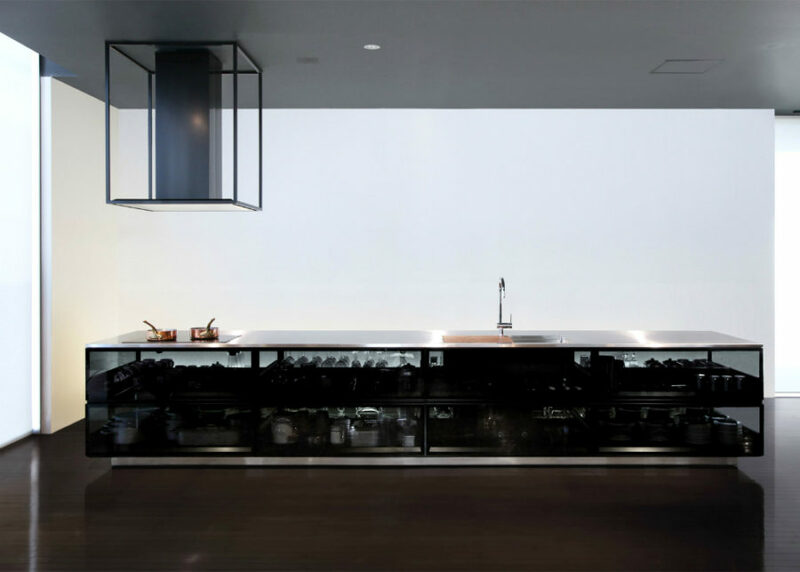 HOME 07 by i29 interior architects has a very unusual kitchen design that comes as a single unit you can approach from both sides. This allows to make space for cooking and washing as well as offers a lot of storage space. The cabinets that are designed more like shelving units are disguised with slim doors that are laser cut in unusual pattern. These openings allow to identify the contents of each cabinet and easily access the necessary one. 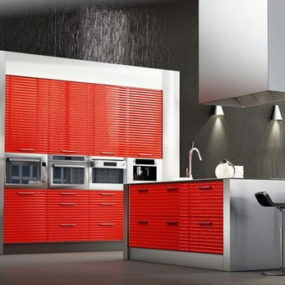 Contemporary kitchen cabinets offer a lot of flexibility in terms of the look and feel of your kitchen. It can be more unusual and homely or feature luxurious artistic details that will take the mundanity and utilitarianism out of it. 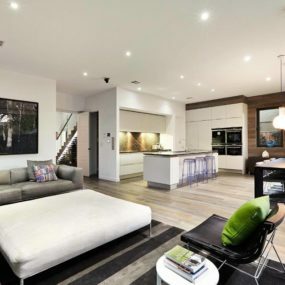 There are a lot of new exciting trends and design solutions that will help you realize your vision and probably discover something entirely fresh and unexpected.